Dina Wadia (15 August 1919 – 2 November 2017) was the daughter and only child of the founder of Pakistan, Muhammad Ali Jinnah, and his wife, Rattanbai Petit. Her mother was a member of two of elite families of Bombay — the Petits and the Tata family. In 1938, she married industrialist Neville Wadia, a member of the prominent Wadia family, and had two children–that includes the businessman Nusli Wadia. However, the marriage did not last long, and she separated from Wadia in 1943; the couple never formally divorced because divorce was illegal in India at the time. Dina was born in London, shortly after midnight, on 15 August 1919, to the founder of Pakistan, Muhammad Ali Jinnah (often informally referred to as "Jinnah"), and his second wife, Rattanbai Petit (whose name was legally amended to Maryam Jinnah after her marriage, though she did not use her new name). As Stanley Wolpert's Jinnah of Pakistan records: "Oddly enough, precisely twenty-eight years to the day and hour before the birth of Jinnah's other offspring, Pakistan". Her premature arrival was unexpected — her parents were at the theatre, but "were obliged to leave their box hurriedly." She was reported to be "a dark-eyed beauty, lithe and winsome, with a smile like her mother's." Dina's paternal great-grandfather, Premjibhai "Meghji" Thakkar, was a Hindu of Lohana caste who converted to Islam and became a Khoja Shia in the 19th century. Her maternal grandparents were Parsi and had disowned her mother, Rattanbai, when she married Jinnah and converted to Islam. Her paternal grandparents were from Gujarat and had moved to Karachi for business in the mid-1870s, where her father, Jinnah, was born. Her father, Jinnah, and her aunt, Fatima, are each important historical figures who started the Pakistan movement. Jinnah's struggle for Muslims eventually led to the creation of Pakistan in 1947, with founder Jinnah as its first Governor General of Pakistan. Jinnah and Fatima were also bestowed with the titles "Father of the Nation" and "Mother of the Nation", respectively. Her mother, Rattanbai (better known as "Ruttie"), was born into two of the elite class Parsi families of India: the Petits and the Tata family. Ruttie's paternal great-grandfather, Dinshaw Maneckji Petit, was the first baronet of Petit, and founded the first cotton mill in India. Her maternal great-grandfather, Ratanji Dadabhoy Tata, and grand-uncle, Jehangir Tata, were the chairpersons of Tata Group. Her maternal great-grandmother, Suzanne Brière, was the first women in India to drive a car. Jinnah's first wife, Emibai Jinnah, was her step-mother. After Ruttie's death, Fatima moved in with Jinnah to help raise her niece, Dina. Jinnah raised his daughter as a Muslim. According to Jinnah's chauffeur, Bradbury, Jinnah asked his sister, Fatima, "to teach her niece, Dina, about Islam and The Holy Qur'an". During Jinnah's time in London, during 1930–33, Wolpert commented, "Dina was [Jinnah's] sole comfort, but Dina was away at school most of the time and home only for brief times, yet still the pampered daughter could be a joy to her doting father". In November 1932, Jinnah read H. C. Armstrong's biography of Kemal Atatürk, Grey Wolf, and seemed to have found his own reflection in the story of Turkey's great modernist leader. It was all he talked about for a while at home, even to Dina, who consequently nicknamed him "Grey Wolf". Wadia's relationship with her father became strained when she expressed her desire to marry the Parsi-born Indian Neville Wadia. Jinnah, a Muslim, tried to dissuade her, but failed. M. C. Chagla, who was Jinnah's assistant at the time, recalls: "Jinnah, in his usual imperious manner, told her that there were millions of Muslim boys in India, and she could have chosen anyone. Reminding her father that his wife (Wadia's mother Rattanbai), had also been a non-Muslim, a Parsi also coincidently, the young lady replied: 'Father, there were millions of Muslim girls in India. Why did you not marry one of them?' And he replied that, 'She became a Muslim'." Jinnah's then associate and later a prominent judge M. C. Chagla recounts in his autobiography Roses in December that when Dina married Neville, Jinnah said to her that she was not his daughter any more. However, this story is contentious as some say that Jinnah had sent a bouquet through his driver, Abdul Hai, to the newly married couple. Their relationship is a matter of legal conjecture as Pakistani laws allow for a person to be disinherited for violating Islamic rules (in this case by a Muslim woman marrying a non-Muslim), and hence no claim of hers was entertained on the Pakistani properties of Jinnah. The Wadias lived in Mumbai and had two children, a boy and a girl. But the marriage did not last long and the couple divorced in 1943. Following the marriage the father-daughter relationship became extremely formal. However, the legal notice of disowning never came, which is essential for such purposes. They did correspond, but he addressed her formally as 'Mrs. Wadia'. This too is contentious as Dina rebuffed this information calling it a rumor. In an interview with Hamid Mir, she said: "My father was not a demonstrative man but he was an affectionate father. My last meeting with him took place in Bombay in 1946. When I was about to depart, my father hugged Nusli [who was two years old then]. The grey cap [Jinnah was wearing] caught Nusli’s fancy and in a moment my father put it on Nusli’s head saying, 'Keep it my boy'." Her final sentence in the interview was "No Jinnah, no Pakistan." "My darling Papa, First of all I must congratulate you — we have got Pakistan….how hard you have worked for it…I do hope you are keeping well — I get lots of news of you from the newspapers. The children are just recovering from their whooping cough, it will take another month yet. I am taking them to Juhu on Thursday for a month or so. Are you coming back here? If so I hope you will drive out to Juhu and spend the day if you like. Anyway I have a phone so I will ring you up and drive in to see you if you don’t feel like coming out. Take care of yourself Papa darling. Lots of love & kisses, Dina." After Jinnah returned to Mumbai from England to take charge of the Muslim League, he built himself a palatial mansion South Court (informally called "Jinnah House") in Mumbai, which became his residence during the politically momentous decade preceding the creation of Pakistan. The house was designed by Claude Batley, a British architect, and was built in 1936 at a total cost of ₹200,000 (US$2,800). After partition in 1947, the 2.5 acres (10,000 m2) property, "South Court", overlooking the sea and located at 2, Bhausaheb Hirey Marg (then Mount Pleasant Road), Malabar Hill, was classified as evacuee property. In 1948, it was subsequently leased to the British Deputy High Commission which occupied it till 1982. Successive Pakistan Governments often expressed deep interest in acquiring the property free of charge for sentimental reasons. During his visit to India, President Pervez Musharraf renewed Pakistan's claim to the house when he had had suggested to Indian Prime Minister Atal Bihari Vajpayee should be given to Pakistan so that it could be turned into a consulate. In 2007, Dina Wadia filed a writ petition before the Bombay High Court, claiming that Jinnah House could not be classified as "evacuee property", as her father had died without leaving behind a will and demanded that the house be handed over to her. In March 2004, Wadia visited Lahore, Pakistan, to watch a cricket match between Pakistan and India. She considered "cricket diplomacy" to be an enthralling dimension that illustrated an entirely new phase in relations between India and Pakistan. But she and her son Nusli Wadia chose not to share their thoughts with the public on what was certainly a highly emotional encounter. Wadia had not traveled to Pakistan since her father's funeral in September 1948. Wadia, her son Nusli Wadia and grandsons Ness Wadia and Jehangir Wadia also visited the mausoleum of her father to pay homage. In the visitors' book, Wadia wrote: "This has been very sad and wonderful for me. May his dream for Pakistan come true." Reports said that she asked for copies of three pictures she saw in the mausoleum's antiquities room. In one picture, she is standing with her father and aunt, Fatima Jinnah. The other is a painting of her mother, Rattanbai Jinnah. In the third, her father is dictating a letter, showing Mohammad Ali Jinnah's political persona. Dina also went to the tomb of Madar-e-Millat Fatima Jinnah to pay respects to her aunt and Flagstaff House Pakistan to hoist the flag of Pakistan and her father's house Wazir Mansion. Dina died at her home in Madison Avenue in New York City on 2 November 2017, at the age of 98 from pneumonia. Her death was deeply mourned by the people of Pakistan, and was described as the "nation's grief". Several political leaders, including the Prime Minister and President of Pakistan issued official statements on her death, and the later said that she was "greatly respected and admired in Pakistan". The Sindh Assembly in Pakistan observed a one-minute silence in her remembrance and offered Al-Fatiha for her and her father's departed soul. Dina was survived by her son and Wadia group chairman Nusli Wadia, daughter Diana Wadia, and grandsons Ness Wadia and Jehangir Wadia. ^ "Quaid-i-Azam's daughter Dina Wadia passes away at 98 in New York". The Express Tribune. 2 November 2017. Retrieved 4 November 2017. ^ a b Walsh, Judith E. (10 July 2017). "A Brief History of India". Infobase Publishing – via Google Books. ^ a b c "Quaid-i-Azam Muhammad Ali Jinnah – Founder of Pakistan & Former 1st Governor-General of Pakistan". 25 October 2013. ^ a b "Gujarat's gifts to India and Pakistan". The Express Tribune. 23 February 2012. ^ a b c "Fact file: Jinnah's family". Dawn. 26 December 2009. Retrieved 1 November 2017. Dina and Neville lived in Mumbai and had two children, a boy and a girl, before the couple divorced. ^ a b "Two nations and a daughter at war over house". South China Morning Post. 21 October 2007. Retrieved 2 November 2017. Ms Wadia, who moved to New York after divorcing her husband, divides her time between New York, London and Mumbai, where her son Nusli runs one of India's largest textile companies. ^ "Girl who made Jinnah walk many miles". www.telegraphindia.com. Retrieved 2019-01-09. ^ InpaperMagazine, From (3 March 2012). "First lady: The Flower of Bombay". DAWN.COM. Retrieved 27 March 2018. ^ a b c d e "Dina Wadia and her darling papa". Geo News. PTI. 2 November 2017. Retrieved 2 November 2017. ^ "Dina Wadia & Muhammad Ali Jinnah: A daughter's journey". WION News. Zee Media Corporation Ltd., Essel Group. 1998. Retrieved 26 October 2018. ^ a b "Muslim law doesn't apply to Jinnah, says daughter". The Indian Express. 14 October 2008. ^ a b "A closed fist worth millions". ^ a b Ambedkar, Bhimrao Ramji; Moon, Vasant (10 July 2017). "Dr. Babasaheb Ambedkar, Writings and Speeches". Education Department, Government of Maharashtra – via Google Books. ^ Vijayraghavan, Kala (24 June 2015). "Business baron Nusli Wadia attends to his ailing mother" – via The Economic Times. ^ "The truth about Aslam Jinnah". 10 July 2009. ^ a b "Dina Wadia, Mohammad Ali Jinnah's only child, passes away". The Times of India. PTI. 2 November 2017. Retrieved 2 November 2017. ^ "Girl who made Jinnah walk many miles". Telegraph India. 3 November 2017. Retrieved 26 December 2017. ^ a b "Remembering Dina". Tribune.pk. 17 November 2017. 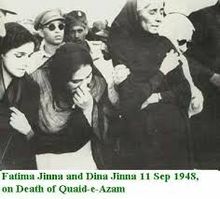 ^ "Dina Wadia visits mausoleum of Quaid". DAWN.COM. 27 March 2004. ^ "President, PM convey nation's grief at Dina Wadia's funeral". Dawn.com. 5 November 2017. ^ "Pakistan mourns the death of Jinnah's only child Dina Wadia". Hindustan Times. 5 November 2017. ^ "Jinnah's daughter Dina Wadia dies in New York". The Hindu. 2 November 2017. ISSN 0971-751X. Retrieved 2 November 2017. ^ Richa Taneja (3 November 2017). "All About Dina Wadia, The Only Daughter Of Pakistan Founder Jinnah". NDTV. Retrieved 3 November 2017. ^ "Dina Wadia's death: Sindh Assembly observes a minute of silence". Samaa TV. PTI. 2 November 2017. Retrieved 2 November 2017. This page is based on the Wikipedia article Dina Wadia; it is used under the Creative Commons Attribution-ShareAlike 3.0 Unported License (CC-BY-SA). You may redistribute it, verbatim or modified, providing that you comply with the terms of the CC-BY-SA.